For a moment she couldn’t breathe, and then the barest whisper passed her lips—half spontaneous praise, half simple awe. “Oh my…I’ve found Paradise!” From within her sporty little red convertible, Raine Presley peered through a misty early March drizzle at the most beautiful piece of land she’d ever seen. Paradise Pines Lodge. Her home for the next few months. Aside from the forest of tall Cambria pines, which she had expected to see, the grounds boasted a huge number of beautiful old sycamore trees—tall, stately, and dripping with silvery Spanish moss. Moonlight glowed through the lacy fingers of hanging flora, creating a somewhat haunting air, and a tiny shiver made its way up her spine. But not enough to make her turn and leave. The beauty far outshone the slight spookiness of moss in moonlight. Square in the center of the surrounding forest of variegated tree species, many of which Raine found unfamiliar, the lodge itself demanded far more than a passing glance. The website had described Paradise Pines Lodge as “spacious.” Raine chuckled as she pulled her car under the east carport, as she’d been directed. Spacious was a blatant understatement. The place was huge, and yet warmth and welcome radiated from within. Lights shone from every facing window—and they were many. Two chimneys, one on each end of the lodge, sent thin plumes of smoke spiraling into the sky. Miss Angelina Love, with whom Raine had communicated via email, had provided a bit of history on the duplex, which had once been a popular fishing lodge. The former owner, known only as Preacher, renovated the interior shortly before his death, turning each floor into a single large apartment. The upper dwelling was available for rent on a seasonal basis. No one got to stay at Paradise Pines for a week or two…it was all season or not at all. The online photographs did little justice to this place. Now that Raine sat, stunned and overwhelmed, staring at the old lodge, she understood why the waiting list was long, even though the site made it clear Paradise Pines would host only one guest per season—or perhaps a small family. Only the upper apartment was offered for rent, and the unit had only two bedrooms. She assumed the lower level was occupied by the owner, or possibly management. An applicant’s chances of being chosen were slim, even within a few years of applying. “Thank You, Lord!” She breathed a prayer into the silence inside her vehicle. How she’d managed to find favor with whoever granted access to this place, given her last-minute application for spring tenancy, she had no idea…but now, with her stunned gaze taking in the glorious surroundings, she had to believe God had a hand in it. She climbed out and headed for the large entryway, pulling her suitcase and trying to take in everything as she went. So much incredible beauty. Even the months she planned to stay seemed inadequate. How would she ever make herself leave? Pausing at the end of the walkway, she studied the log building. Lights in a dozen windows lent the place an almost magical feel, as if she stood on the brink of a fairyland. But wasn’t there something else? Some aura that placed a pale but luminous glow around the entire lodge? As she stood, suitcase handle in one hand and handbag hanging off the other shoulder, a large insect flitted close and hovered a few feet in front of her. Startled for a moment, she laughed when she realized it was a gorgeous monarch butterfly. The monarch flew closer, brushed against her cheek, and then backed away to hover a foot or two in front of her yet again. Raine laughed. “So you came out just to welcome me? Well, thank you kindly, little one. I appreciate that.” She shook her head. Good thing no one was around to witness her talking to an insect. Her parents, in particular. They’d think she’d lost her mind. The creature circled her body in a graceful, fluttering dance of delicate wings, and then flew off toward the woods. In the next instant, the front door opened and Raine caught her first glimpse of Miss Angelina Love. Snowy white hair formed a glowing nimbus around the woman’s head. With the lights behind her tall, willowy figure and the moonlight between Raine and the door, the result was a perfect halo. Miss Love’s maxi-length sheath—the same pure white as her hair—only added to the startling illusion. Raine gasped when an amorphous shadow beyond the doorway moved in a soft wave, creating a massive pair of shadowy wings. She released a breath when the shadow disappeared. “Raine! Is that you? Come in out of that drizzle!” Even Miss Love’s voice had a melodious trill that, given the impression already created by light and shadow, put Raine in mind of angelic song. She shook her head at her own fanciful imagination. In her defense, however, she’d been driving several hours and spent most of the previous night packing after a long, grueling argument with her parents about this trip. No wonder she was seeing things and imagining even more. “Yes, ma’am. I’m Raine Presley.” She arrived at the door and found herself mesmerized by a pair of eyes the bright, clear blue of a summer sky and a smile that surely epitomized the word welcome. Tiny lines around Miss Love’s eyes and mouth spoke to the fact that she smiled often. She wasn’t exactly beautiful, and yet…something about her was. Raine couldn’t stop staring and felt a blush warming her cheeks at her own impolite reaction. The moment she stepped into the large, open entry area and released her grip on the handle of her suitcase, Miss Love folded her into a gentle hug. 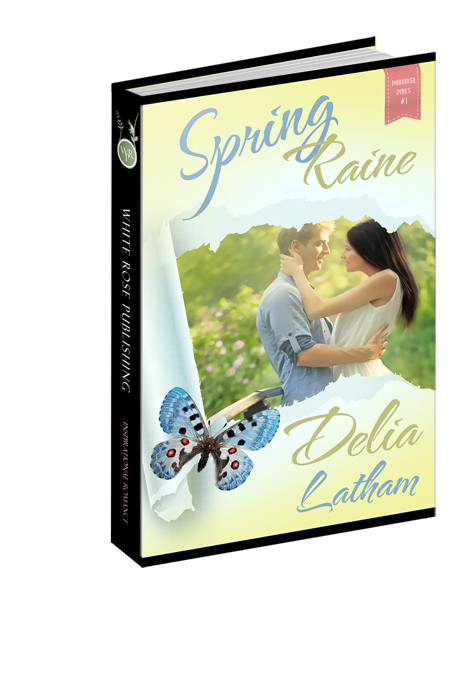 For one awful moment, Raine was sure Miss Love’s kindness would open a floodgate, releasing a veritable deluge of tears. This trip to Cambria had come at a high emotional cost for her. For the first time in the entirety of her existence, she’d stood up to her parents for something she wanted. What was so wrong with taking some time to just be…to simply enjoy life before launching herself into the career she’d worked hard and long to achieve? A position within the state forensics department was no small accomplishment, even as an apprentice. Raine was well aware that she was the envy of many of her classmates at the university. But the job would be taxing and life consuming. She’d be sacrificing her secret dream of having a home and family—even a real life outside her job. So she’d demanded this getaway to Cambria, in the face of her parents’ blatant disapproval. That disapproval had weighed on her during the entire four-hour drive from Pasadena. Her father’s thunderous expression, along with her mother’s disappointed one as she drove away, left her feeling like a bad daughter and a horrible human being. They’d always been wonderful, supportive parents…didn’t she owe it to them to be a perfect daughter? But she so desperately needed this time away, to be on her own for a time. No one telling her what to do or what decisions she should make. Miss Love’s warm, open-armed welcome and a smile that said Raine wasn’t a terrible person comforted her to a ridiculous degree. After all, the woman needed to welcome her tenants. Her pleasant demeanor was most likely good customer relations. That’s all Raine could possibly be to her—a young woman who had rented the upstairs apartment for a time. If she didn’t leave happy, the owner of this beautiful paradise in the Cambrian pines risked a bad review online. No, she shouldn’t take Miss Love’s sweet welcome too personally. But she could enjoy it for the moment. She fell in love, just as she’d known she would. Someone certainly knew how to paint “welcome” into the walls and furnishings. Raine felt immediately at home, as if she could stay forever. But of course, she couldn’t. She had a job and two unhappy parents to get back to as soon as her springtime respite was past. Within an hour, she’d put away everything she’d brought and settled in to relax…alone…in “her own” place. What a grand feeling! She rose early the next morning. Being overexcited wasn’t conducive to sleeping in late, which she’d planned to do. Instead, come 7 AM, she’d already donned fitness clothing and running shoes. After circling the lodge twice, trying to take everything in, she spotted a narrow foot trail in the wooded area at the rear of the property and set off at a jog. Birds called early-morning greetings as sunshine peeked through the branches hanging over the path. Butterflies flitted and bees buzzed around bushes and plants, the likes of which Raine had never seen, all in lush spring bloom. Their blossoms created bright splashes of color in the dim woods. A gentle breeze lifted her ponytail, and Raine pulled in a lungful of sweetly scented air. Could Heaven be any better than this? As she moved through the shadowy woods, in and out of bright spots of sunshine, something she could only call joy stirred from a deep slumber somewhere within her soul. Laughter bubbled from her lips, and she made no attempt to rein it in. By the time she burst into a clearing at the end of the path, Raine thought she’d explode if she didn’t release some of the exuberance and just plain happiness that filled her soul. She bounced into the clearing, whirling around in a joyous dance of praise, her feet moving in time to the song in her soul. A deep male voice, clearly not sharing Raine’s “moment,” crashed her happy time, sending shivers of shock and fright throughout her entire system—mind and body. She stopped whirling so quickly she stumbled, but managed to catch herself before falling flat on her face. Her heart, so full of abandon and joy the moment before, threatened to beat its way free of her chest. Swinging toward the icy voice, Raine stared into steel-gray eyes beneath dark blond eyebrows pulled low in an angry frown. A matching beard and mustache, carefully maintained to look like a couple days of scruff, shadowed a face that might have been dangerously handsome—if its owner weren’t trying to kill her with a piercing, narrow gaze. “I—I—” She swallowed hard and almost pushed out another attempt, but the stranger interrupted. “Never mind. You’re on private property. And thanks to your noisy arrival, I’ve just destroyed my wood sculpture.” He held up a small piece of wood, clearly bearing signs of new marks from a carving tool…and a jagged break where it had broken off of something bigger and stronger. “No!” Raine’s horrified gaze drifted behind the man to what was clearly a workstation in a state of orderly chaos. Logs of different types and sizes lay in separate piles. Sawdust and bits of wood and chips littered the ground around a large carved piece…a bear, its maw open in a shockingly lifelike display of aggression. An unsightly gouge in the wood left a glaring flaw on one side of the animal’s head. The irate man staring her down held the missing chunk of pine—or oak, or teak, or whatever this fellow used to create his masterpieces—in his hand. “I’m so sorry!” Heat rushed into Raine’s face, even as her stomach turned a double somersault. No wonder he was angry. Anger battled with embarrassment, and Raine swung back the way she’d come. She deeply regretted having caused damage to the truly stunning carving, but she certainly hadn’t set out to do so. How could she have known people worked in the woods in Cambria? He took a step toward her, his lips drawn into a tight line. “I’m rude? Lady, I’m not the one who barged onto someone else’s property without permission.” His chilly gaze narrowed to a glittering slit, and Raine’s eyes widened when his hands tightened into fists that looked hard enough to do some real damage. Raine fled into the trees. Fast. Question 1: Were you surprised to discover Raine, at 26 years old, still lived with her parents? Why? Question 2: Raine startled Declan on their first meeting, causing him to damage an important carving. Did his anger give you a bad first impression of him? Question 3: Raine's heart for troubled teens led her to speak with a teen boy, a hitchhiker, and take him to lunch. She later rescued a teen girl, and took her home with her. These actions could be construed as a risk, and even dangerous. What did you think of Raine's actions with Cole and Tara? Question 4: Under the impression she was a teenager, Declan made a promise to his father and the Cayucos mayor to keep an eye on Raine. Although he felt guilty about that agreement later, he didn't immediately tell Raine about it. Should he have? How would you have felt in Raine's position? In Declan's? Question 5: Raine witnessed Miss Angie praying in the woods, and the experience changed her life. What was your first impression of the prayer scene? Question 6: Did you find Raine's parents too dictatorial, or just over-protective of their daughter's? Was Raine right to insist on taking a break before starting her new job, despite her parents' blatant disapproval? Question 7: Dec was influenced to a great degree by Harold Beal's house, Nitt Witt Ridge, and the story behind it. Why did Beal's story made such an impression on him? What do you think of Beal's project of 30+ years?